A new version of the Slingshot! plug-in has been released. The primary aim was to consolidate functionality for better workflow. In addition, some components have new or expanded output features which I hope will be useful. PS I will be traveling to China tonight on business for the next three weeks. Apologies in advance if I am not able to provide support or answer questions immediately. My lecture is titled Dataspaces and Uncertainty... in no way did I draw those words out of a hat at random. I will be discussing recent work at NBBJ, my Slingshot! project, and other observations on computation in practice. 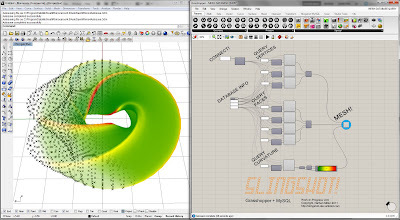 The speaker list includes experts from around Los Angeles on the topic of parametric design and computation. Participating firms include Perkins+Will, Morphosis, Gehry Partners, Gensler, Thornton Tomasetti, Buro Happold... and more! Visit the website for a full speaker list and schedule. I have provided the SQL source code and a Grasshopper definition for creating a simple mesh database containing tables for vertices and faces. This is the standard database table format I have been using in my recent Slingshot! demos. Grab the SQL code here...! 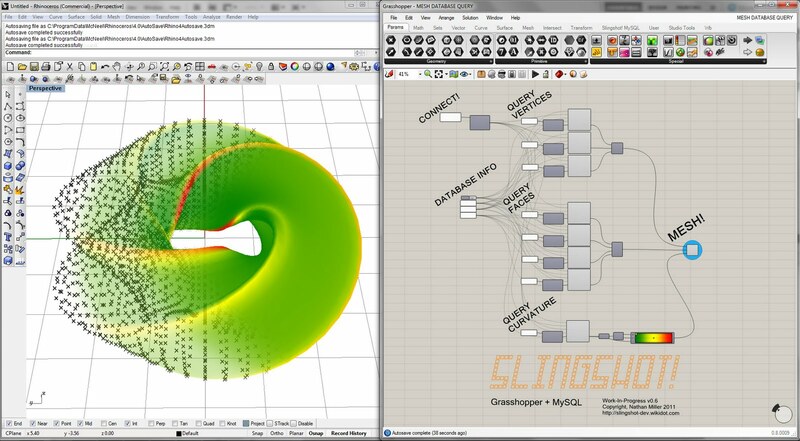 Parametric, generative, BIM.... web browsing? This proof-of-concept video shows a Grasshopper-generated model being updated and visualized within Google Chrome. The Slingshot! plug-in updates a database when the model changes. After each, change the web browser is refreshed to show changes to the 3D visual and the database tables. In the video demonstration below, MySQL queries are used to progressively assemble a Grasshopper mesh using information stored in database tables on a remote computer. First, individual x,y,z coordinates are queried from a points table to create the point cloud. Third, gaussian curvature values are queried and used to produce the gradient color. Get the latest release of the plug-in here....!